Only in the last few years have there been reliable, secure and very well insulated roller door ranges available in the UK, and now Samson Doors offer the widest range of high quality made to order commercial and industrial insulated roller shutter door systems, ensuring any building has the best and most reliable roller door for regular access but also keeping the inside temperature as constant as possible whilst saving heating bills and preventing staff from getting cold in the winter. Samson supply reliable and secure insulated 'high speed' roller type doors with double skinned foam filled curtains, meaning you no longer have to have a high speed fabric door combined with a standard roller door for the security out of hours. 2 doors into one door! 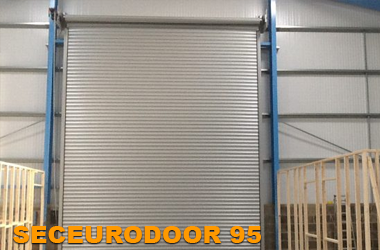 With the extra security gained from a double skinned insulated roller door it is arguable you actually have 3 doors in one!! Samson offer a steel or aluminium insulated roller door for use as a multi purpose door system in any building requiring good levels of insulation as well as security . 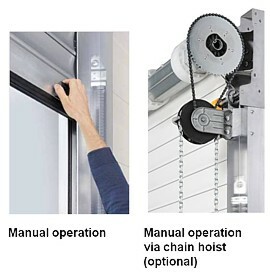 The doors can be manually operated up to a certain size with operation by either a spring assisted simple push up and pull down or a chain operated and geared system if the door is too high or over a certain maximum size. 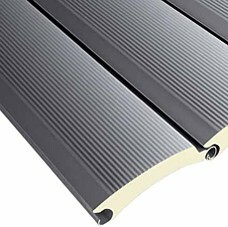 The slats used are either aluminium or steel with a foam filled core and a smooth or microprofile design to the front to provide an attractive and practical surface finish enhancing your building. The standard non painted finish has a superb visual apperance but the slats can also be painted if required to suit your colour requirements and corporate branding. Samson Doors also offer a range of higher specification insulated roller doors to provide insulation for larger openings or where higher levels of insulation are required. 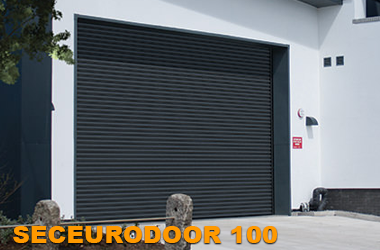 The HR116 insulated roller door can be manufactured up to 10 metres wide and uses a special support to enhance the wind protection ability giving the door one of the best wind ratings of any roller type door. 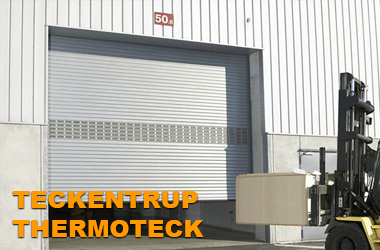 The more advanced and larger insulated roller doors also benefit greatly from the use of the patented ZAK system to reduce a lot of stress on the door curtain when fully closed or open. The roller barrel moves forward or backwards as necessary to ensure the curtain slides vertically in the side channels and not at an angle, creating stress on the slats. This will ensure longer life span and less noise during operation as well as reduced servicing costs. The gap is also reduced to the absolute minimum between the curtain face and the internal lintel face for the minimum heat loss and draught. 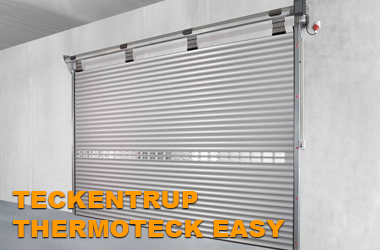 Without the ZAK system fitted the curtain of the roller door is stressed at the upper and lower limits when it cannot feed in perfectly straight.